I define brands as personifications of organizations or their products and services and I spend a lot of time talking about the emotional, experiential and self-expressive aspects of brands. Indeed, brands mostly connect with people on an emotional level. But I want to focus on functional benefits today. I have spent the better part of March traveling for business and pleasure. I have stayed in numerous hotels and even on a sailboat. Having spent weeks away from home in different living spaces the importance of attention to detail has been driven home to me. Let's take sailboats as an example. I spent seven nights on a forty foot sailboat with five other people. The boat was our home. We cooked, grilled, ate, slept, showered, kayaked, swam, snorkeled and traveled on this sailboat. It requires a very high level of skill to design an aesthetically pleasing, fast, safe, seaworthy, comfortable boat on which to live for extended periods of time. Every square inch of space needs to be used to maximum advantage. Electrical systems, plumbing systems, navigation systems, sail systems and several other necessary systems need to be crammed into this limited space. Space for several people to move around comfortably is required. Good ventilation is necessary. There is also the need to keep things as dry as possible. 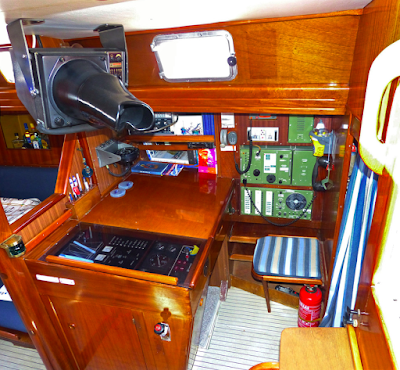 Anti-skid decks and and hand holds are required throughout the boat as are other safety features. And then there are the creature comforts - cup holders, sound systems, facial tissue dispensers, technology (computer, iPhone, etc.) interfaces, etc. Provisions must be made for every possible catastrophic event - power loss, grounding, fire, hurricane, rouge wave, etc. Finally, traditional luxury materials (teak, mahogany, brass) must be balanced with more modern, functional materials (carbon fibre and other low weight, high strength composite materials). Having sailed and cruised on many different vessels produced by different boat/yacht manufacturers/brands (Baltic Yachts, Bavaria, Beneteau, Bermuda Cutter, C&C Yachts, CW Hood, Hinkley Yachts, Hobie Cat, Island Packet Yachts, J/Boats, Janneau, Laser Boats, Morris Yachts, Nautor's Swan, Pacific Seacraft, Pearson Yachts, Sabre Yachts, Sailfish, Schock Harbor, Sunfish, Tartan Yachts), I can verify that the sailing performance, spaciousness, creature comforts, craftsmanship, aesthetics, sea worthiness, durability and performance in light and heavy air varies greatly from boat to boat. This is where attention to detail comes in. The total user experience is created by that attention to detail. To anticipate every conceivable user need in every conceivable situation leads to a better product and brand. While I believe sailboats are an extreme example of this, hotels, automobiles, mobile phones, restaurants and many other product categories also need to carefully think through and design for the total user experience. And this requires great attention to detail. While brand managers would do well to focus on the emotional brand experience, they must not neglect the attention to detail that creates the best overall functionality.